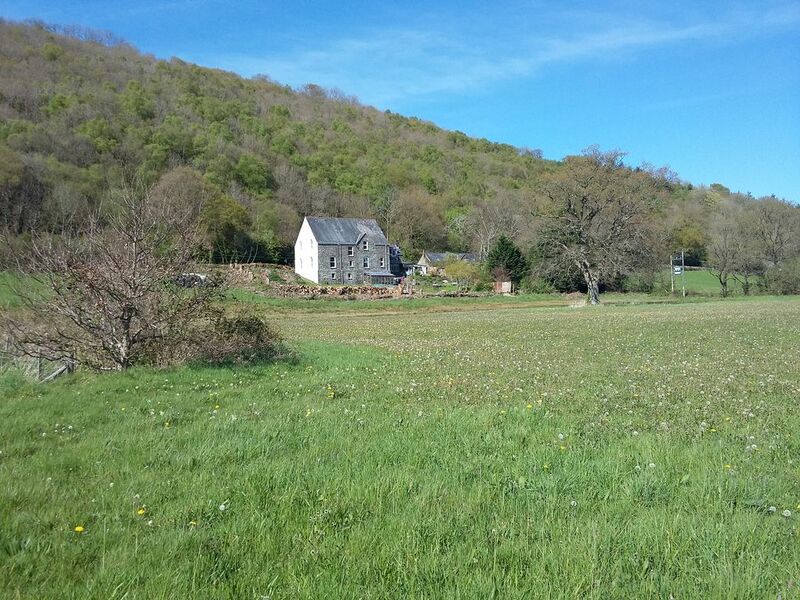 Located in the Aeron Valley in West Wales and surrounded by stunning countryside views is Woodlands, a 19th Century Vicarage offering dog and cat friendly, adult only self-catering holiday accommodation. The Brecon Suite is a large, luxury apartment, fully self-contained with its own front door. With a private hot tub in the garden, exclusively for your use, relaxation is the key. By day you can bubble away looking out across the uninterrupted valley views, watching the Red Kites circling overhead. By night, you can lay back and gaze at the stars - we have zero light pollution and protected dark skies, making our night skies some of the best you'll ever see. Your pets are welcomed as part of the family here at Woodlands. THREE dogs are automatically accepted (more than three can be accommodated depending on size - please contact us before booking). Cats are also welcome and all pets stay completely FREE OF CHARGE. The Brecon Suite has a large lounge, double bedroom, kitchen/diner and bathroom and is furnished to a very high standard with everything you need for your stay. On the ground floor of the property is a large laundry room offering washing machine and ironing facilities, as well as a boot room. Brecon Suite has a dedicated parking bay with electric charge point. A large entrance hall with free book and DVD library and local attraction leaflets, brochures and ordnance survey maps. With ample space for wellies, boots and coats. Dog towels are also provided, as well as spare leads, toys and water bowls which you can take out with you if needed. With washing machine, drying and ironing facilities, freezer and sink. The laundry room is very large and can also be used as a safe space to store bikes/outdoor equipment. Read our reviews to see how our guests love the facilities here at Woodlands. We have alpacas joining the Woodlands family very soon and will be running alpaca trekking from Spring 2019. Please contact us for details. The upper garden has a private hot tub (for Brecon Suite guests only). There is also a picnic table with parasol, gas bbq, sun loungers and coffee table and armchairs. The lower garden is a large lawned area, which is completely enclosed making it a safe place to relax with your dog/s, who can be safely off their leads. There is also a picnic table with parasol, sun loungers, coffee table, bench and armchairs. With beautiful views up and down the valley and across the fields. We have walking right from the doorstep, taking you across the river and up into the woodland on the other side of the valley. Situated in an ideal position for sight-seeing, Woodlands is a 20 minute drive to the nearest (year round dog friendly) beach in one direction, and 20 minutes into the Cambrian Mountains in the other. This makes Woodlands the ideal location for walking, cycling and climbing enthusiasts. There is so much to do in the local area, you will never be short of places to go or things to see. Excellent property, superb location and great facilities for humans and pooches alike! Probably the most dog friendly property we have ever stayed in. The owner Mandy and her two labradors made us very welcome. We used the appt as a base to explore the area and went for walks on the beach (20 min away) visited the Cambrian mountain parks and just spent the most relaxing time. The views from our appt were serene and we couldn’t have asked for more. My parents recently visited The Woodlands and were delighted with their overall stay. Mandy was very accommodating and lovely. The whole property is idyllic and beautiful and our spaniel pip enjoyed her pampering, lovely stay. Great location and a great host with some good ideas for what to do etc. Small niggles the bed was uncomfortable, the land around the house is privately owned and can not be accessed (the pics make it look like you can walk on it). Don't let it distract you. Thanks for your review and I'm glad you enjoyed your stay. In response to your niggles... I'm sorry you found the bed uncomfortable - if you had mentioned it at any point during your 6 night stay, I'd have been happy to try and do something to make you more comfortable. I'm surprised you didn't mention it when I asked if you were comfortable and had everything you needed (to which you replied yes). Also, as I informed you when you asked, there is a public footpath running right through the valley and surrounding fields which you could have used, so the surrounding land is, in fact, totally accessible and frequently used by my guests. Thanks again for your review and for choosing Woodlands as your holiday destination. Had a lovely time staying here, lovely owner, scenery, wildlife and accommodation. A nice touch was that Mandy the owner got my wife a birthday card and flowers for our first night there. Would definitely stay again. Thank you. Absolutely charming apartment in fantastic surroundings. If you want to stay local there are some lovely walks and some spectacular views if you want to go up to the Cambrian mountains. Mandy was the perfect hostess and the welcome packs were sublime for humans and doggies. Mandy is a lovely landlady took care of our every need. Our little dog was well catered for. Can't fault the accomodation or Mandy in anyway. Had a wonderful stay.